The Axon.ivy ivy Engine caches 20 JSF Dialog views per session. As I have a huge dialog with lots of sub-Dialogs this consuming a lot of memory on the Engine. Can I somehow reduce the amount of cached views? Why does JSF cache the views at all? These views are kept in the memory to allow the user open multiple dialogs in separate taps. Furthermore it also make back-navigation with the browser possible. At least while the previous dialog was not closed by executing a close dialog event. What is the drawback of this cache? 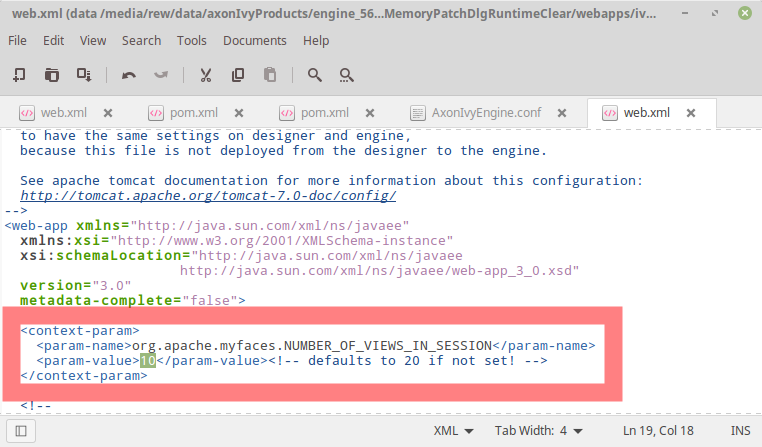 This cached views can grow big if you have huge dialog with many embedded sub-dialogs. Especially if you eagerly render all their contents even when they are not visible until the user opens a pop-up, sub-tab or similar. The size come from holding the complete view state and @ViewScoped managed beans. So you could run into OutOfMemoryErrors on the engine if you have many users on your engine that open huge dialogs. When to limit the cache? If you run out of memory on the engine. And you know that most of the time your users are only working with a single browser-tab. Then it could be sufficient to only cache the last 5 or 10 views.